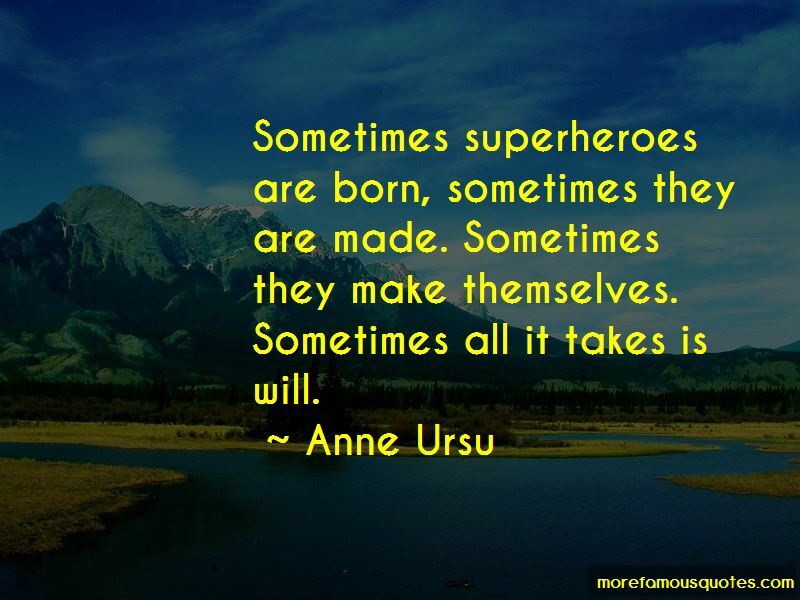 Enjoy the top 87 famous quotes, sayings and quotations by Anne Ursu. “Hazel had read enough books to know that a line like this one is the line down which your life breaks in two. And you have to think very carefully about whether you want to cross it, because once you do it's very hard to get back to the world you left behind. And sometimes you break a barrier that no one knew existed, and then everything you knew before crossing the line is gone. But I can tell you this," he continued. "The white witch doesn't feel things the way we do, do you understand? She's all ice. That is her whole point." A palace of ice and a heart to match. "I don't understand. Why would people go looking for her? Why would they want to go with her?" Ben sat back. He looked at Hazel searchingly, sadly. His shoulders rose and fell. "Sometimes," he said slowly, "it seems like it would be easier to give yourself to the ice. Jack hesitated still, and Hazel wanted to say something comforting, give him some bright plastic flowers of words, but Jack would see them for what they were. Jack knew how to see things. “She could have taken root. She wanted to be a Rose, somebody's Rose, their Rose-and she would have been company for the flowers. She had new memories to give them, new people to tell them of, people who would help tend to them and keep them. But they warned her. They saved her. 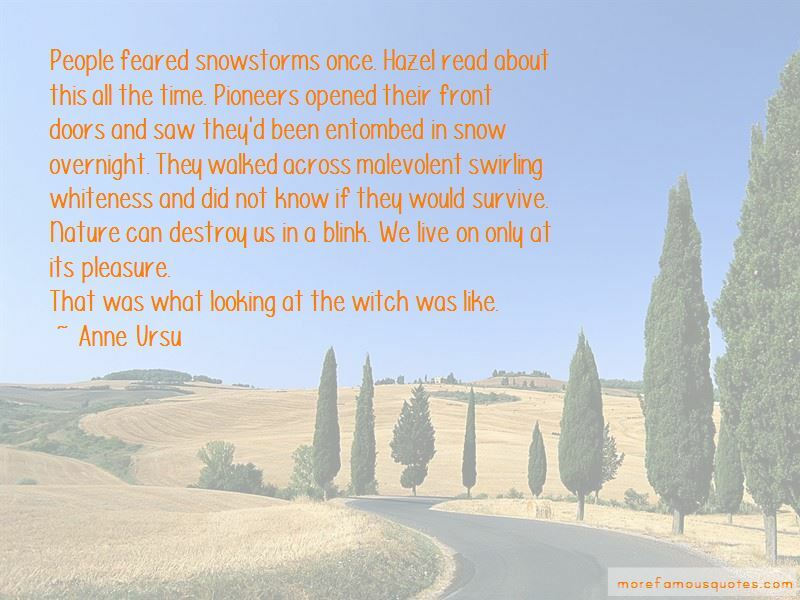 “People feared snowstorms once. Hazel read about this all the time. Pioneers opened their front doors and saw they'd been entombed in snow overnight. They walked across malevolent swirling whiteness and did not know if they would survive. Nature can destroy us in a blink. We live on only at its pleasure. “Once upon a time, there was a boy named Jack who got lost in the woods. His best friend went after him. Along the way, she had many adventures. She met woodsmen, witches, and wolves. She found her friend in the thrall of a queen who lived in a palace of ice and had a heart to match. She rescued him with the help of a magical object. And they returned home, together, and they lived on, somehow, ever after. No one else needed to do this. No one else needed lessons on how to be a person. It was a beautiful lie that they had all been telling themselves-that you could have magic without monsters. She did not know how to react, for when your heart has been poisoned and someone picks a dandelion for you - because it is bright and yellow and you seem like you could use something like that - all you can do is contemplate the funny ways of weeds. She did not like seeing her loved ones like this, bent over with sorrow; everything in her wanted to cry out, to thrash and scream at the sight of it. But she knew that great grief came from great love, and that their grief was an honor to her. And she did love them so very much. Something was wrong with him - and down deep he'd known his whole life. Maybe the wards had even said something. (You are not right, boy.) Maybe the other children had. (What's wrong with you?) Maybe it had happened while he watched one child after another walk off with a family from the Eastern Villages, with a merchant or a farmer. (You know no one will ever take you, right?) Maybe he'd even said it to himself. There is something in the magic we have that is greater than the magic we can do. They said words they did not mean, and their conversations seemed to follow all kinds of rules-rules that no one has ever explained to Oscar. “Hugging himself, Oscar leaned against the pantry wall. For two days all he had wanted was for Caleb to come back, and now he was back and Oscar had made a mess of things: he had angered half the customers and confused the other half, and the coin boxes did not look as they should, and [rich, noble] people were complaining about him, and he couldn't look at anybody, and [redacted] was dead, and Oscar was odd. 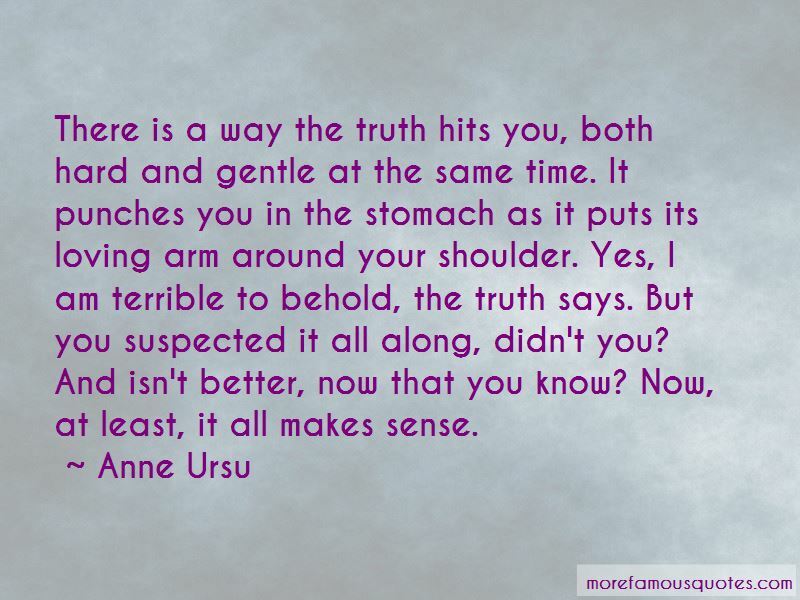 Want to see more pictures of Anne Ursu quotes? 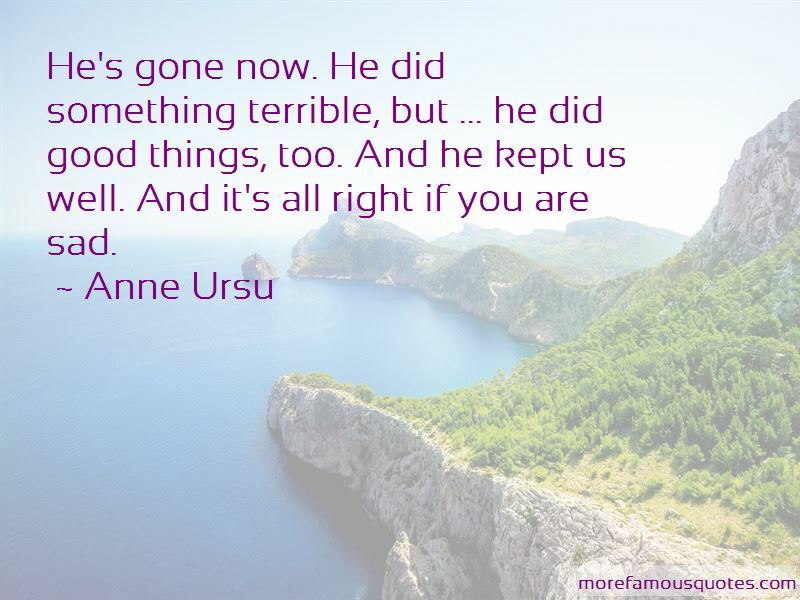 Click on image of Anne Ursu quotes to view full size.